Garrett will do anything to preserve the Sanderson bloodline, including human sacrifice. 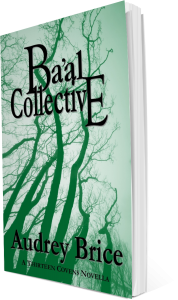 Mary Rose, the last of the blood born Sanderson’s, was content to be a docile housewife, allowing her husband, John, to run her father’s legacy – The Ba’al Collective. Until she learns John’s terrible secret. A secret so dangerous it could rip the coven apart. For Magus Garrett Hammon, it’s time for the Sanderson bloodline to retake its rightful leadership, and exalt the coven to its former glory. But at what cost? Sacrifices must be made. Are you ready to choose a side? Thirteen Covens Update: You know what this means, right? One more novella – Order of Eurynome – and the first paperback with the first seven stories comes out. We’re calling the first paperback BLOODLINES BOOK ONE. Probably coming September! So those who have been waiting for a paperback, or who want the first seven books for the keeper shelf (you know you do! ), it’s coming! Or you can wait for the full BLOODLINES collection (all 14 stories), which is going to be released in paperback, hardcover, and ebook. But that’s not coming until 2019. Hence the reason we decided to release a paperback every 7 stories. Not to mention by the time Order of Eurynome is done, we’re pushing 100,000 words for the first 7 stories. BTW – I’m not doing a newsletter tonight. I might put one out tomorrow. 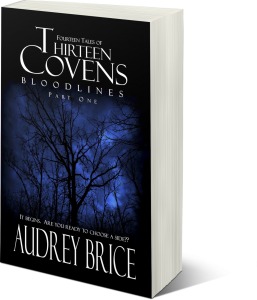 The big newsletter will be the one announcing Order of Eurynome, because I’ll be doing an exclusive list only drawing for a copy of FOURTEEN TALES OF THIRTEEN COVENS: BLOODLINES Book One. This entry was posted in Audrey Brice, books, new releases and tagged 50's housewife, divorce, domestic abuse, horror, occult fiction, stockholm syndrome, thriller by Steph. Bookmark the permalink.